WARNING: Death Related to Ultra-Rapid Metabolism of Codeine to Morphine Respiratory depression and death have occurred in children who received codeine following tonsillectomy and/or adenoidectomy and had evidence of being ultra-rapid metabolizers of codeine due to a CYP2D6 polymorphism (see WARNINGS - Codeine Phosphate - Death Related to Ultra-Rapid Metabolism of Codeine to Morphine). Inactive ingredients: sodium benzoate, methylparaben, sodium saccharin, sorbitol, glycerin, citric acid, sodium citrate, caramel flavor and USP purified water. Codeine: Codeine probably exerts its antitussive activity by depressing the medullary (brain) cough center, thereby raising its threshold for incoming cough impulses. Codeine is readily absorbed from the gastrointestinal tract, with a therapeutic dose reaching peak antitussive effectiveness in about 2 hours and persisting for 4 to 6 hours. Codeine is rapidly distributed from blood to body tissues and taken up preferentially by parenchymatous organs such as liver, spleen and kidney. It passes the blood brain barrier and is found in fetal tissue and breast milk. The drug is not bound by plasma proteins nor is it accumulated in body tissues. Codeine is metabolized in the liver to morphine and norcodeine, each representing about 10 percent of the administered codeine dose. About 90 percent of the dose is excreted within 24 hours, primarily through the kidneys. Urinary excretion products are free and glucuronide-conjugated codeine (about 70%), free and conjugated norcodeine (about 10%), free and conjugated morphine (about 10%), normorphine (under 4%) and hydrocodone (<1%). The remainder of the dose appears in the feces. Triprolidine: Antihistamines such as triprolidine hydrochloride act as antagonists of the H1 histamine receptor. Consequently, they prevent histamine from eliciting typical immediate hypersensitivity responses in the nose, eyes, lungs and skin. Animal distribution studies have shown localization of triprolidine in lung, spleen and kidney tissue. Liver microsome studies have revealed the presence of several metabolites with an oxidized product of the toluene methyl group predominating. Pseudoephedrine: Pseudoephedrine acts as an indirect sympathomimetic agent by stimulating sympathetic (adrenergic) nerve endings to release norepinephrine. Norepinephrine in turn stimulates alpha and beta receptors throughout the body. The action of pseudoephedrine hydrochloride is apparently more specific for the blood vessels of the upper respiratory tract and less specific for the blood vessels of the systemic circulation. The vasoconstriction elicited at these sites results in the shrinkage of swollen tissues in the sinuses and nasal passages. Pseudoephedrine is rapidly and almost completely absorbed from the gastrointestinal tract. Considerable variation in half-life has been observed (from about 4½ to 10 hours), which is attributed to individual differences in absorption and excretion. Excretion rates are also altered by urine pH, increasing with acidification and decreasing with alkalinization. As a result, mean half-life falls to about 4 hours at pH 5 and increases to 12 to 13 hours at pH 8. After administration of a 60 mg tablet, 87 to 96% of the pseudoephedrine is cleared from the body within 24 hours. The drug is distributed to body tissues and fluids, including fetal tissue, breast milk and the central nervous system (CNS). About 55 to 75% of an administered dose is excreted unchanged in the urine; the remainder is apparently metabolized in the liver to inactive compounds by N-demethylation, parahydroxylation and oxidative deamination. General: Triacin-C should be prescribed with caution for certain special-risk patients, such as the elderly or debilitated, and for those with severe impairment of renal or hepatic function, gallbladder disease or gallstones, respiratory impairment, cardiac arrhythmias, history of bronchial asthma, prostatic hypertrophy or urethral stricture, and in patients known to be taking other antitussive, antihistamine or decongestant medications. Patients’ self-medication habits should be investigated to determine their use of such medications. Triacin-C is intended for short-term use only. Advise patients that some people have a genetic variation that results in codeine changing into morphine more rapidly and completely than other people. Most people are unaware of whether they are an ultra-rapid codeine metabolizer or not. These higher-than-normal levels of morphine in the blood may lead to life-threatening or fatal respiratory depression or signs of overdose such as extreme sleepiness, confusion, or shallow breathing. Children with this genetic variation who were prescribed codeine after tonsillectomy and/or adenoidectomy for obstructive sleep apnea may be at greatest risk based on reports of several deaths in this population due to respiratory depression. As a result, codeine is contraindicated in all children who undergo tonsillectomy and/or adenoidectomy. Advise caregivers of children receiving codeine for other reasons to monitor for signs of respiratory depression (see WARNINGS – Death Related to Ultra-Rapid metabolism of Codeine to Morphine). 1. Patients should be warned about engaging in activities requiring mental alertness such as driving a car, operating dangerous machinery or hazardous appliances. 2. Patients with a history of glaucoma, peptic ulcer, urinary retention or pregnancy should be cautioned before starting this product. 3. Patients should be told not to take alcohol, sleeping pills, sedatives or tranquilizers while taking Triacin-C.
4. Antihistamines may cause dizziness, drowsiness, dry mouth, blurred vision, weakness, nausea, headache or nervousness in some patients. 5. Patients should be told to store this medicine in a tightly closed container in a dry, cool place away from heat or direct sunlight and out of the reach of children. 6. Nursing Mothers – refer to following section titled “Nursing Mothers.” (see WARNINGS – Death Related to Ultra-Rapid Metabolism of Codeine to Morphine). This product should not be used by persons intolerant to sympathomimetics used for the relief of nasal or sinus congestion. Such drugs include ephedrine, epinephrine, phenylephrine and phenylpropanolamine. Symptoms of intolerance include drowsiness, dizziness, weakness, difficulty in breathing, tenseness, muscle tremors or palpitations. Codeine may be habit-forming when used over long periods or in high doses. Patients should take the drug only for as long, in the amounts, and as frequently as prescribed. 2. other narcotic analgesics, alcohol, general anesthetics, tranquilizers, sedative-hypnotics, surgical skeletal muscle relaxants, or other CNS depressants, by causing increased CNS depression. This product may diminish the antihypertensive effects of guanethidine, bethanidine, methyldopa and reserpine. Drug/Laboratory Test Interactions: Codeine: Narcotic administration may increase serum amylase levels. Carcinogenesis, Mutagenesis, Impairment Of Fertility: No adequate studies have been conducted in animals to determine whether the components of Triacin-C have a potential for carcinogenesis, mutagenesis or impairment of fertility. Pregnancy: Teratogenic Effects – Pregnancy category C. Animal reproduction studies have not been conducted with Triacin-C. It is also not known whether this product can cause fetal harm when administered to a pregnant woman or can affect reproduction capacity. This product should be given to a pregnant woman only if clearly needed. 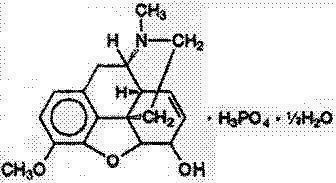 Teratology studies have been conducted with the three ingredients of Triacin-C. Pseudoephedrine studies were conducted in rats at doses up to 150 times the human dose; triprolidine was studied in rats and rabbits at doses up to 125 times the human dose, and codeine studies were conducted in rats and rabbits at doses up to 150 times the human dose. No evidence of teratogenic harm to the fetus was revealed in any of these studies. However, overt signs of toxicity were observed in the dams which received pseudoephedrine. This was reflected in reduced average weight and length and rate of skeletal ossification in their fetuses. Nursing Mothers: The components of Triacin-C are excreted in breast milk in small amounts, but the significance of their effects on nursing infants is not known. Because of the potential for serious adverse reactions in nursing infants from maternal ingestion of this product, a decision should be made whether to discontinue nursing or to discontinue the drug, taking into account the importance of the drug to the mother. (see WARNINGS – Death Related to Ultra-Rapid Metabolism of Codeine to Morphine). As in adults, the combination of an antihistamine, sympathomimetic amine and codeine can elicit either mild stimulation or mild sedation in pediatric patients. In pediatric patients particularly, the ingredients in this drug product in overdosage may produce hallucinations, convulsions and death. Symptoms of toxicity in pediatric patients may include fixed dilated pupils, flushed face, dry mouth, fever, excitation, hallucinations, ataxia, incoordination, athetosis, tonic clonic convulsions and postictal depression, (see CONTRAINDICATIONS and OVERDOSAGE sections). Use In Elderly (Approximately 60 Years Or Older): The ingredients in Triacin-C are more likely to cause adverse reactions in elderly patients. 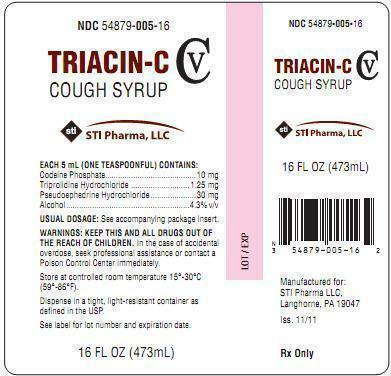 Triacin-C is indicated for temporary relief of coughs and upper respiratory symptoms, including nasal congestion, associated with allergy or the common cold. Codeine sulfate is contraindicated for postoperative pain management in children who have undergone tonsillectomy and/or adenoidectomy. Hypersensitivity To (1) codeine phosphate or other narcotics; (2) triprolidine hydrochloride or other antihistamines of similar chemical structure; or (3) sympathomimetic amines, including pseudoephedrine. Sympathomimetic amines are contraindicated in patients with severe hypertension, severe coronary artery disease and in patients on monoamine oxidase (MAO) inhibitor therapy (see PRECAUTIONS - Drug Interactions). Respiratory depression and death have occurred in children who received codeine in the post­operative period following tonsillectomy and/or adenoidectomy and had evidence of being ultra­rapid metabolizers of codeine (i.e., multiple copies of the gene for cytochrome P450 isoenzyme 2D6 or high morphine concentrations). Deaths have also occurred in nursing infants who were exposed to high levels of morphine in breast milk because their mothers were ultra-rapid metabolizers of codeine (see PRECAUTIONS-Nursing Mothers). Some individuals may be ultra-rapid metabolizers because of a specific CYP2D6 genotype (gene duplications denoted as *1/*1xN or *1/*2xN). The prevalence of this CYP2D6 phenotype varies widely and has been estimated at 0.5 to 1% in Chinese and Japanese, 0.5 to 1% in Hispanics, 1 to 10% in Caucasians, 3% in African Americans, and 16 to 28% in North Africans, Ethiopians, and Arabs. Data are not available for other ethnic groups. These individuals convert codeine into its active metabolite, morphine, more rapidly and completely than other people. This rapid conversion results in higher than expected serum morphine levels. Even at labeled dosage regimens, individuals who are ultra-rapid metabolizers may have life-threatening or fatal respiratory depression or experience signs of overdose (such as extreme sleepiness, confusion, or shallow breathing) (see OVERDOSAGE). Children with obstructive sleep apnea who are treated with codeine for post-tonsillectomy and/or adenoidectomy pain may be particularly sensitive to the respiratory depressant effects of codeine that has been rapidly metabolized to morphine. Codeine is contraindicated for post-operative pain management in all pediatric patients undergoing tonsillectomy and/or adenoidectomy (see CONTRAINDICATIONS). When prescribing codeine-containing drugs, healthcare providers should choose the lowest effective dose for the shortest period of time and inform patients and caregivers about these risks and the signs of morphine overdose. Triacin-C should be used with considerable caution in patients with increased intraocular pressure (narrow angle glaucoma), stenosing peptic ulcer, pyloroduodenal obstruction, symptomatic prostatic hypertrophy, bladder neck obstruction, hypertension, diabetes mellitus, ischemic heart disease, and hyperthyroidism. In the presence of head injury or other intracranial lesions, the respiratory depressant effects of codeine and other narcotics may be markedly enhanced, as well as their capacity for elevating cerebrospinal fluid pressure. Narcotics also produce other CNS depressant effects, such as drowsiness, that may further obscure the clinical course of patients with head injuries. General:Dryness of mouth, dryness of nose, dryness of throat, urticaria, drug rash, anaphylactic shock, photosensitivity, excessive perspiration and chills. Cardiovascular System: Hypotension, headache, palpitations, tachycardia, extrasystoles. Nervous System: Sedation, sleepiness, dizziness, disturbed coordination, fatigue, confusion, restlessness, excitation, anxiety, nervousness, tremor, irritability, insomnia, euphoria, paresthesias, blurred vision, diplopia, vertigo, tinnitus, acute labyrinthitis, hysteria, neuritis, convulsions, CNS depression, hallucination. Respiratory System: Thickening of bronchial secretions, tightness of chest and wheezing, nasal stuffiness, respiratory depression. Like other medications containing a narcotic, Triacin-C is controlled by the Drug Enforcement Administration. It is classified under Schedule V.
Codeine can produce drug dependence of the morphine type, and therefore it has a potential for being abused. Psychic dependence, physical dependence and tolerance may develop on repeated administration. When dependence on codeine occurs at therapeutic doses, it appears to require from one to two months to develop, and withdrawal symptoms are mild. Most patients on long-term oral codeine therapy show no signs of physical dependence upon abrupt withdrawal. Overdosage with codeine can cause transient euphoria, drowsiness, dizziness, weariness, diminution of sensitivity, loss of sensation, vomiting, transient excitement in children, and occasionally in adult women, miosis progressing to nonreactive pinpoint pupils, itching sometimes with skin rashes and urticaria and clammy skin with mottled cyanosis. In more severe cases, muscular relaxation with depressed or absent superficial and deep reflexes and a positive Babinski sign may appear. Marked slowing of the respiratory rate with inadequate pulmonary ventilation and consequent cyanosis may occur. Terminal signs include shock, pulmonary edema, hypostatic or aspiration pneumonia and respiratory arrest, with death occurring within 6-12 hours following ingestion. Overdoses of antihistamines may cause hallucinations, convulsions, or possibly death, especially in infants and children. Antihistamines are more likely to cause dizziness, sedation, and hypotension in elderly patients. Overdosage with triprolidine may produce reactions varying from depression to stimulation of the Central Nervous System (CNS); the latter is particularly likely in children. Atropine-like signs and symptoms (dry mouth, fixed dilated pupils, flushing, tachycardia, hallucinations, convulsions, urinary retention, cardiac arrhythmias and coma) may occur. Overdosage with pseudoephedrine can cause excessive CNS stimulation resulting in excitement, nervousness, anxiety, tremor, restlessness and insomnia. Other effects include tachycardia, hypertension, pallor, mydriasis, hyperglycemia and urinary retention. Severe overdosage may cause tachypnea or hyperpnea, hallucinations, convulsions, or delirium, but in some individuals there may be CNS depression with somnolence, stupor or respiratory depression. Arrhythmias (including ventricular fibrillation) may lead to hypotension and circulatory collapse. Severe hypokalemia can occur, probably due to compartmental shift rather than depletion of potassium. No organ damage or significant metabolic derangement is associated with pseudoephedrine overdosage. The toxic plasma concentration of codeine is not known with certainty. Experimental production of mild to moderate CNS depression in healthy, nontolerant subjects occurs at plasma concentrations of 0.5-1.9µg/mL when codeine is given by intravenous infusion. The single lethal dose of codeine in adults is estimated to be from 0.5 to 1.0 gram. It is also estimated that 5 mg/kg could be fatal in children. The LD50 (single, oral dose) of triprolidine is 163 to 308 mg/kg in the mouse (depending upon strain) and 840 mg/kg in the rat. Insufficient data are available to estimate the toxic and lethal doses of triprolidine in humans. No reports of acute poisoning with triprolidine have appeared. The LD50 (single, oral dose) of pseudoephedrine is 726 mg/kg in the mouse, 2206 mg/kg in the rat and 1177 mg/kg in the rabbit. The toxic and lethal concentrations in human biologic fluids are not known. Excretion rates increase with urine acidification and decrease with alkalinization. Few reports of toxicity due to pseudoephedrine have been published and no case of fatal overdosage is known. Therapy, if instituted within 4 hours of overdosage, is aimed at reducing further absorption of the drug. In the conscious patient, vomiting should be induced even though it may have occurred spontaneously. If vomiting cannot be induced, gastric lavage is indicated. Adequate precautions must be taken to protect against aspiration, especially in infants and children. Charcoal slurry or other suitable agents should be instilled into the stomach after vomiting or lavage. Saline cathartics or milk of magnesia may be of additional benefit. In the unconscious patient, the airway should be secured with a cuffed endotracheal tube before attempting to evacuate the gastric contents. Intensive supportive and nursing care is indicated, as for any comatose patient. If breathing is significantly impaired, maintenance of an adequate airway and mechanical support of respiration is the most effective means of providing adequate oxygenation. Hypotension is an early sign of impending cardiovascular collapse and should be treated vigorously. Do not use CNS stimulants. Convulsions should be controlled by careful administration of diazepam or short-acting barbiturate, repeated as necessary. Physostigmine may be also considered for use in controlling centrally mediated convulsions. For codeine, continuous stimulation that arouses, but does not exhaust, the patient is useful in preventing coma. Continuous or intermittent oxygen therapy is usually indicated, while naloxone is useful as a codeine antidote. Close nursing care is essential. Saline cathartics, such as milk of magnesia, help to dilute the concentration of the drugs in the bowel by drawing water into the gut, thereby hastening drug elimination. Adrenergic receptor blocking agents are antidotes to pseudoephedrine. In practice, the most useful is the beta-blocker propranolol, which is indicated when there are signs of cardiac toxicity. In severe cases of overdosage, it is essential to monitor both the heart (by electrocardiograph) and plasma electrolytes and to give intravenous potassium as indicated by these continuous controls. Vasopressors may be used to treat hypotension, and excessive CNS stimulation may be counteracted with parenteral diazepam. Stimulants should not be used. 2 teaspoonfuls (10 mL) every 4 to 6 hours, not to exceed 8 teaspoonfuls (40 mL) in 24 hours. 1 teaspoonful (5 mL) every 4 to 6 hours, not to exceed 4 teaspoonfuls (20 mL) in 24 hours. Triacin-C, is supplied in a colorless, caramel flavored vehicle in 16 fl oz pint (473 mL) size bottles. Store at controlled room temperature 20°to 25°C (68° to 77°F) [See USP Controlled Room Temperature. ].